A partial shutdown that could occur at midnight Friday risks disrupting government operations and leaving hundreds of thousands of federal employees furloughed or working without pay over the holiday season. WASHINGTON (AP) — The White House on Tuesday appeared to inch away from forcing a partial government shutdown over funding for a southern border wall, with Press Secretary Sarah Huckabee Sanders saying there are "other ways" to secure the $5 billion in funding that President Donald Trump wants. It was the first sign of a potential White House counter offer as the clock ticks down toward Friday's deadline to fund the government. "At the end of the day, we don't want to shut down the government," Sanders said on Fox News. "We want to shut down the border from illegal immigration." Trump's $5 billion is far more than the $1.3 billion Democrats have offered, which is not for Trump's promised wall along the southern border with Mexico, but fencing and other security measures. Sanders pointed to one bill, likely referring to the Senate's bipartisan appropriation measure for the Department of Homeland Security, which provides $26 billion, including $1.6 billion for fencing and other barriers. It was approved by the committee in summer on a bipartisan vote. "That's something that we would be able to support," she said, as long as it's coupled with other funding, such as using defense money on border security. What other funds could be tapped to satisfy the president's demand remains unclear. Asked about using military funds, Sanders said, "There's certainly a number of different funding sources that we've identified that we can use that we can couple with the money that would be given through Congressional appropriations that would help us get to that $5 billion that the president needs in order to protect our borders." The fight over Trump's border wall has brought Congress to a familiar standoff just days before Christmas. It wasn't always like this, with Congress and the White House at a crisis over government funding. The House and Senate used to pass annual appropriation bills, and the president signed them into law. But in recent years the shutdown scenario has become so routine that it raises the question: Have shutdowns as a negotiating tool lost their punch? A partial shutdown that could occur at midnight Friday risks disrupting government operations and leaving hundreds of thousands of federal employees furloughed or working without pay over the holiday season. Costs would be likely in the billions of dollars. Trump was meeting with his team and getting regular updates, Sanders said. Trump has also tweeted to keep up the pressure. Exiting a Senate Republican leadership meeting late Monday, Sen. John Thune of South Dakota said, "It looks like it probably is going to have to build for a few days here before there's a solution." The president is insisting on $5 billion for the wall, but he does not have the votes from the Republican-led Congress to support it. It's unclear how many House Republicans, with just a few weeks left in the majority before relinquishing power to House Democrats, will even show up midweek for possible votes. Speaker Paul Ryan's office had no update. Many Republicans say it's up to Trump and Democrats to cut a deal. Senate Majority Leader Mitch McConnell and Trump talk most days, but the senator's spokesman would not confirm if they spoke Monday about a plan. McConnell opened the chamber hoping for a "bipartisan collaborative spirit" that would enable Congress to finish its work. "We need to make a substantial investment in the integrity of our border," McConnell said. "And we need to close out the year's appropriation process." Meanwhile, more than 800,000 government workers are preparing for the uncertainty ahead. The dispute could affect nine of 15 Cabinet-level departments and dozens of agencies, including the departments of Homeland Security, Transportation, Interior, Agriculture, State and Justice, as well as national parks and forests. "Our members are asking how they are supposed to pay for rent, food, and gas if they are required to work without a paycheck," said a statement from J. David Cox, Sr., president of the American Federation of Government Employees, the large federal worker union. "The holiday season makes these inquiries especially heart-wrenching." Many agencies, including the Pentagon and the departments of Veterans Affairs and Health and Human Services, are already funded for the year and will continue to operate as usual, regardless of whether Congress and the president reach agreement this week. Congress already approved funding this year for about 75 percent of the government's discretionary account for the budget year that began Oct. 1. The U.S. Postal Service, busy delivering packages for the holiday season, wouldn't be affected by any government shutdown because it's an independent agency. Trump said last week he would be "proud" to have a shutdown to get Congress to approve a $5 billion down payment to fulfill his campaign promise to build a border wall. During his 2016 presidential campaign, Trump promised that Mexico would pay for the wall. Mexico has refused. Democratic leaders Chuck Schumer and Nancy Pelosi, in a meeting last week at the White House, suggested keeping funding at its current level, $1.3 billion, for improved fencing. Trump had neither accepted nor rejected the Democrats' offer, telling them he would take a look. Schumer said Monday he had yet to hear from Trump. Speaking on the Senate floor, Schumer warned that "going along with the Trump shutdown is a futile act" because House Democrats would quickly approve government funding in January. "President Trump still doesn't have a plan to keep the government open," Schumer said Monday. "No treat or temper tantrum will get the president his wall." One option for lawmakers would be to provide stopgap funding for a few weeks, until the new Congress convenes Jan. 3, when Pelosi is poised to become House speaker. Wyoming Sen. John Barrasso, who is in line to become the No. 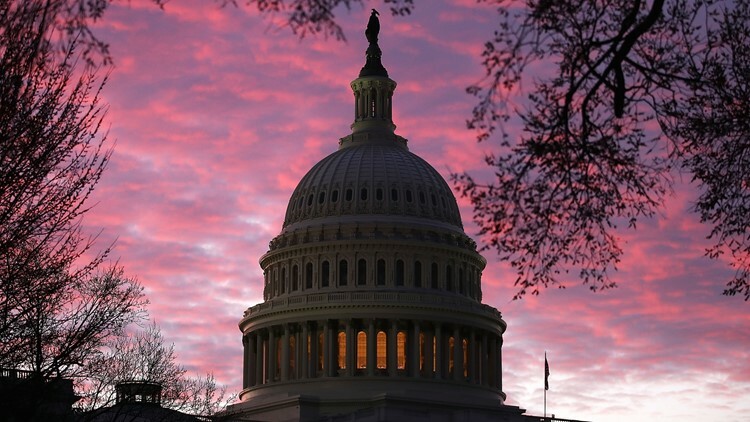 3 Republican in the Senate, suggested a stopgap bill could be one way to resolve the issue or a longer-term bill that includes money for border security. GOP leaders, though, were frustrated as the clock ticked away. Leaving the weekly leadership meeting, Sen. Roy Blunt, R-Mo., said any planning was a "very closely held thing. That's why we should never let this happen. We should pass the bills the way we're supposed to pass them."